In my final article before Latin America Internationals, I’d like to share my breakdown and analysis of my top pick for the event: Malamar. This is the “GasKan” variant, donning lots of techs and consistency as its backbone. 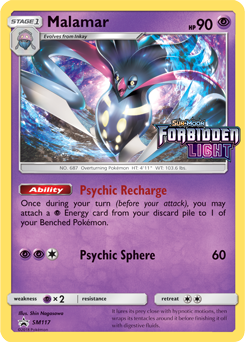 Lost Thunder gave us Spell Tag, a worthy addition to the deck, as well as Giratina, a great new non-GX attacker. In this article I’ll be going over my current list, introducing the new additions, talking about matchups, and more. It is sometimes thrown around to cut a Malamar but I prefer the consistency of the full lineup. Ditto Prism Star is an option in addition to four Inkay, or perhaps in place of an Inkay in the event you want to play a certain tech. I’m sick of Tapu Lele-GX and the liability it brings in this deck, so I’ve decided to just go all in with Marshadow. Let Loose is a great way to disrupt your opponent and give yourself time to set up, but it also draws you cards and extends your turns without having to play a draw Supporter. I prefer the two count instead of one and a Tapu Lele-GX just because the two Prize forfeiture can be game-losing and this lineup still does the job right. Vital Dance increases your attacking percentages on your second turn by about ten percent. Finding Psychic Energy and either attaching one or discarding them in some way is incredible for a deck without something like Battle Compressor in Expanded. Speaking of that sort of mechanic, Shuckle and its Fresh Squeezed is alright in Malamar decks, but I still prefer Oricorio in its place because it’s searchable with Mysterious Treasure and serves the purpose of making Energy fodder or to just attach the Energy you need from your hand, whereas Shuckle is only for that fodder part. With a virtually limitless damage ceiling, this is the main powerhouse of the deck. Playing one can be scary if you prize it or can’t find Rescue Stretcher to recycle it, but you do have Marshadow-GX to copy its attack if need be. Since Escape Board is such a big part of this deck and Necrozma-GX has a Retreat Cost of two, playing multiple Necrozma-GX is ill-advised because it makes for the worst starter there is in this deck. Your main Zoroark-GX counter, there are a variety of attacks you can copy with Shadow Hunt; namely the aforementioned Prismatic Burst, but really anything is an option. Sometimes you might want to use Psychic from Deoxys, the only two-Energy attack this deck has to offer; and other times you may want to use Dawn Wings Necrozma-GX‘s Moon’s Eclipse GX to retain your Energy only to follow it up with a Prismatic Burst for another one-hit Knock Out. Its three Retreat Cost is the worst thing about this card, but it’s a sacrifice you have to make in order to play such a strong Pokemon. Distortion Door can help set up niche Knock Outs, like requiring less Energy for a Prismatic Burst one-shot, especially in conjunction with Choice Band (see three Psychic Energy Prismatic Burst against Zoroark-GX after a Distortion Door). Shadow Impact for 130 is really nice, but the drawback of hitting one of your Pokemon for 40 can be troubling sometimes. It hasn’t ever been game-losing flavor text for me yet, so I plan to continue to play this beast until it is, if ever. Non-GX option number two, Deoxys brings two unique attacks to the table. Psychic requires less Energy than everything else in this deck, and Power Blast does a little less than Giratina but offers a different drawback of discarding an Energy instead of self-inflicting damage. Depending on the situation you’re in there can be a correct one of these two attackers that will work better for you. A lower number of each works just fine with Distortion Door getting Giratina back from the discard pile and Rescue Stretcher doing the same for Deoxys, albeit in a little less flashy fashion.